SHOLOLA.COM: Fear Can Be A Good Thing! 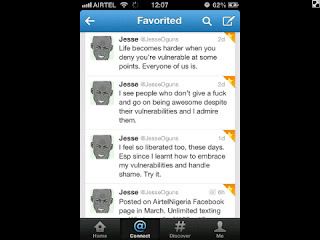 Now let's go back to the image above, it’s a snap shot of some tweet by @JesseOguns. It was what got me thinking and writing. 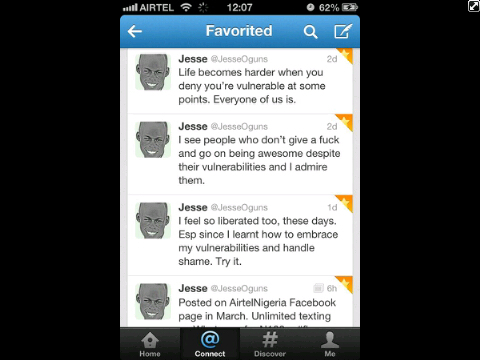 "Life is HARDER when we DENY that we are VULNERABLE ..." Now that is the summary of this piece! We are so focused on being fearless that we forget that fear can be a good thing. It’s what keeps us on our feet; it’s the 7th sense that keeps us in check. What makes fear dangerous is the fear of fear itself! The fear of failure is worse than failing; this I know from experience. I'm talking about the kind of fear that gives you superhuman strength in dealing with sudden danger. Sometimes, all you need is to accept that you are fearful, in other to overcome the real fear. Accepting and making use of your fear is one of the paths to liberty. It can give you a new perspective about the challenges we face as individuals. Our fear can drive us to take positive risks. Fear is a sign that you are about to experience your greatness. Nothing great can be accomplished without facing certain kinds of risk and fear. Fuel your courage by accepting your fear. Fear lives in the unknown but so does possibility! Every great dream is usually a little scary. The moment you accept your fear, you become immortal; the past and the future cease to be. Fear keeps you alive at the most basic level as well. It’s the most vital survival instinct. It is a necessary response to threats and dangers. The adrenaline that our body produces when we venture outside our comfort zones actually creates a high. That is the difference between existing and living! Don't just get rid of your fear, master it and ride it into Victory. "Fuel your courage by accepting your fear." Nicely captured! Great article! Great message!!! Fear indeed can be crippling! A dose of fear is good... It keeps us alive.